At Bedrock Radio, we are always looking for new members who are willing to join our team of volunteers and share their skills with a fantastic charity. What’s involved in being a hospital radio volunteer? We provide a special service to hospital patients & our local health community, only a small part is about presenting programmes! Keeping the station running takes a lot of work, and we expect our volunteers to help with a range of the jobs involved. That includes ward visiting and request collecting, fundraising activities and cleaning the studio, as well as operating the studio equipment, presenting programmes and committee work. Patients in hospital are vulnerable people, so we need measures to protect them. You will be asked for references. Because of the sensitive nature of volunteer work in hospitals, the Rehabilitation of Offenders Act does not normally apply and all convictions, whether “spent” or not, must be declared. But you won’t be refused because of things like parking fines! It helps if you are outgoing and enjoy meeting people, especially for collecting requests on the wards or fundraising keep this station on the air. You don’t need expert knowledge of music, nor any technical expertise – most important is a willingness to learn and be part of a team and be able to make a regular commitment. You will receive all the training you need to become an integral part of the hospital radio team. You will be introduced to the wards and shown how the bedside radios work. You will be trained in basic infection control procedures. If you wish to progress to become a presenter, you’ll get trained in presentation techniques and on the technical equipment in the studio. You’ll also have the opportunity to learn and practice all sorts of other skills, from fundraising to setting up outside broadcast events, and from interviewing to management and committee work. What do I get out of Hospital Radio? The biggest reward for a hospital radio volunteer is having a patients thanking you for keeping them company at a difﬁcult time. It does not matter how much time you spend ‘volunteering’ you will leave the hospital afterwards feeling totally rewarded for the use of your valuable time and effort. We have known patients to write, email, phone and even visit our studio to say thank you for keeping them company. All over the UK, patients can hear music, news and information from their local hospital radio service. There are even a handful of hospital television services. Hospital radio aims to provide comfort and entertainment to patients in hospital with a special mix of music and chat. The service keeps patients in touch with their family and friends through music requests and local news items. Your local hospital also has a radio station dedicated to the patients and staff. They are not unique. There are over 200 hospital broadcasting stations in the United Kingdom serving over 400 hospitals. An estimated total of 8,000 volunteers support these stations and, here at this hospital, we have a loyal band of volunteers who receive no pay or get regular income from the NHS or other government source. Bedrock Radio is unique, as we cover such a vast area, due to the two NHS Trusts we serve. We have volunteers from all areas of London & Essex Including Havering, Barking & Dagenham, Redbridge, Brentwood, Chingford, Waltham Forest, Epping Forest and even as far as Southend-On-Sea! Bedrock Radio are always adapting to embrace latest technologies resulting in moden studios and encouraging volunteers to outreach to the community to encourage listening. Our charitable objective allows us to entertain patients in hospital, but to also outreach the wider health community (For the soical inclusion of outpatients, staff, comunity care etc) in order to promote the benefits of a healthy lifestyle. 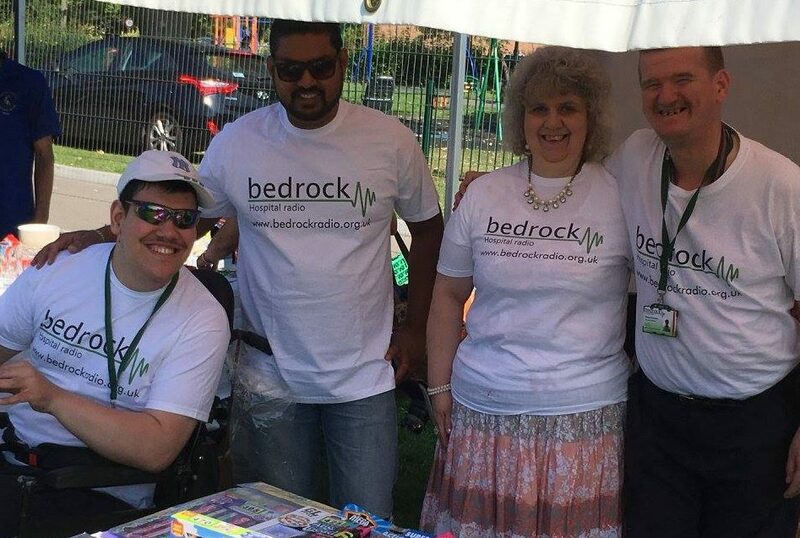 Bedrock Radio get’s involved with our community, attending loads of events from school fetes, festivals, town shows plus more. We like to keep our community updated on events and encourage local people to make the switch to Your Healthy Music Mix!